First Impression: This book has been sitting on my shelf for a while. I’ve been avoiding this because I feared the old style artwork would turn me off and I know I have trouble following action in seinen manga. Meh… it’s a typical gundam story — there’s a faction fighting for freedom from another faction and a single super mech piloted by teenager that can change the tide of the war. And yes, I can’t follow the action sequences. Artwork A: The mech design is detailed and lovingly drawn. The character design is as expected. However, the characters can be told apart and they are expressive. The color pages are gorgeous and serve to make this a special release. I count not being able to follow the action as a weaken on my part, so I don’t feel it’s fair for me to judge. Presentation A-: This book is heavy. I couldn’t read it for more than 15-minutes in situations where I had to hold the book. My poor wrists couldn’t take it. I ended up reading this at the gym on the treadmill or the exercise bike and at home on my desk. Although I like the hardcover presentation and the thick paper stock, I wonder is there a way to get the same look while being lightweight. As you can see, the cover art is very nice. There are similar glossy color pages between the chapters in the book. Also there are some nice bonus essays toward the back the book. This book looks great on my shelves, and honestly I’d buy it just because it looks nice regardless of whether I’d actually read it. Story C: This is a typical gundam story. None of the characters stood out to me. The main character, Amuro, is blah and the main villain Char is vanilla. Char is supposed to be an ace pilot, yet he can’t beat a noob. Yeah, I understand the main character can’t die immediately, but that doesn’t mean they have to confront each other immediately. But I digress. There’s some whiny woman who got on my nerves. I can’t remember her actual name, but in my head she’s “random waifu”. Anyhow, I couldn’t tell you the names of two factions that are fighting and for what specific reason other than “freedom”… but I’m not even sure that’s it. I guess nothing really sunk in from this first volume. All I really understood was Char’s primary mission. So basically, the story and the characters didn’t leave any kind of impression on me good or bad. 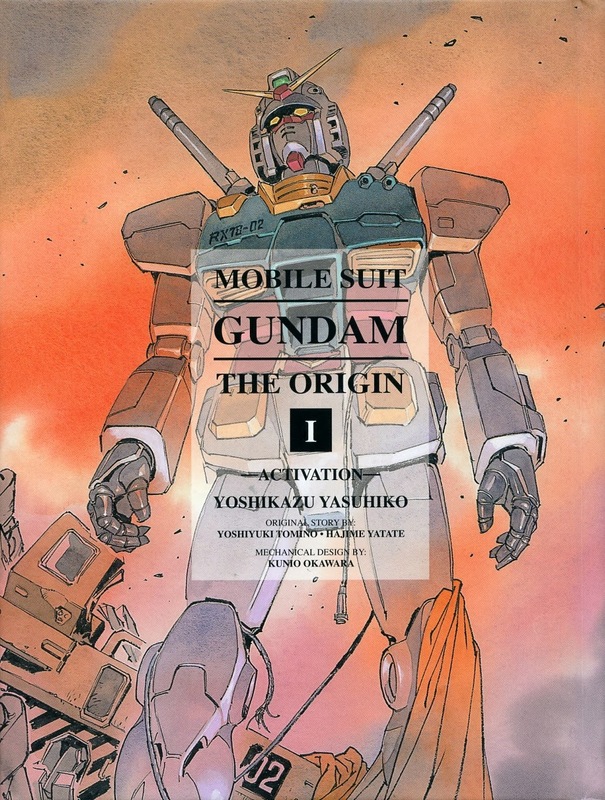 Overall B: I like gundam anime A LOT, but this didn’t do anything for me. However, I did appreciated the technical drawing and the presentation of this book. It’s a handsome book that looks great on my shelf and I like looking at the artwork. In this sense I recommend it. If you are looking for a story, though, there are far more interesting mecha/gundam series out there. “Knights of Sidonia” left a far stronger impression on me than MSGundam The Origin.